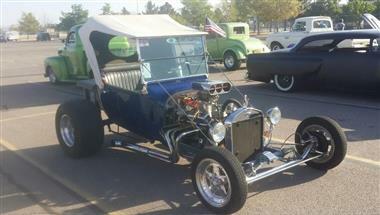 1923 Ford T-bucket in Alamogordo, NM for sale. 1923 Ford T Bucket (NM) - $18,900Exterior BlueInterior Gray LeatherTransmission 350 Chevy AutomaticEngine 350 Chevy Mileage less then 5,000 actual750 holley 4 bbl. Ready to drive and enjoy. 600 HP. Seller owned 1 year. Well maintained and garage kept.This vehicle is located in Alamogordo NM 88310.Please call Ted @ 575-491-6894 to see this car. This vehicle is priced $863 less than the Average Market Price of $19,763 for a 1923 Ford T-bucket. This is a Fair Deal as it's priced 4.0 % below market avg. The Pie chart below shows the number of ads within different price ranges.